"Catherine is SO pretty. She always gets picked FIRST, no matter WHAT it's for! I'm just so sick and TIRED of this. I can't take it anymore. Why doesn't anyone ever pick ME instead?" Vicky spun around on her heels and stomped up the stairs to her room, nearly tripping over the dog, who let out a yelp and scurried out of the way. After letting her cool off a few minutes, Mother headed up the stairs and gently tapped on the bedroom door. "Mind if I come in for a minute?" Hearing Vicky's sobs, Mother turned the knob and entered quietly. Vicky lay across the bed sobbing, her head buried in the pillow. "Vicky," Mother said softly, as she lovingly wiped a tear away, "Do you know you're VERY special to Dad and me and to your Heavenly Father. To me, you're the most beautiful girl in the WHOLE wide world." Esther looked up at the King and gave a wee smile. He stared at her for a few minutes, and Esther wondered what he was thinking about her. She studied his weathered face quietly, thinking that there was no way she'd be good enough for him. Suddenly he broke into a wide smile. "What is your name?" Esther bowed her head and looked at the floor. "Esther, my lord." "Esther," the King repeated. She looked up at his smiling face and blushed slightly. "Come here." Esther paused for a moment, then stood and walked slowly closer to his throne. He took her hand and kissed it gently. "I have seen beauty beyond all beauty. Beauty of the heart and of the flesh!" he exclaimed. Esther smiled to herself but looked down at the floor again. "There's no need to be afraid. 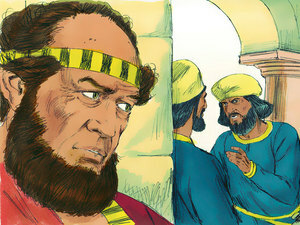 I may be a powerful King, but I do not BITE," the King said, watching Esther carefully. She looked up at him and over at Hegai, who was standing in a corner grinning. She smiled at him, realizing he had said almost the same thing about the King earlier. King Xerxes followed her gaze and beckoned for Hegai to come over. "This woman, Hegai, shall be my Queen. You have cared for her well, and her beauty surpasses all others, inside and out. Thank you." Hegai nodded and said, "You are most welcome, great King, I am honored to be of service to you." Xerxes then called for a servant to bring Queen Vashti's old crown. He took it and placed it gently on Esther's head. "You, Esther, are now my Queen." Esther smiled at him. "I am greatly honored, my lord." "As am I," he responded with a big smile. "I shall throw a feast, a great party celebrating my new Queen - Queen Esther!" "What a beautiful gift!" 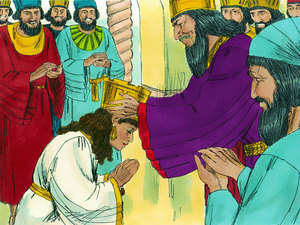 Esther exclaimed when the fourth prince had presented his gift to her. She closed her eyes in delight as she smelled the bottle of fragrance. "Thank you!" The prince nodded, bowed and walked away. Esther felt royal. But now she WAS! She was a royal QUEEN! King Xerxes had thrown a grand feast in honor of his new Queen, and everyone brought them gifts and showed their respect. The whole party had been marvelous and Esther felt WONDERFUL. Being a queen wasn't half as bad as she'd expected and King Xerxes was a wonderful man. Maybe things wouldn't be so bad after all. Mordecai sighed and leaned against the inside walls of the castle. He missed Esther but was happy to be able to see her almost every day. But it was sad she had to hide that she was a Jew from her own husband. It was just so DANGEROUS, maybe not as much if just the King knew, but if OTHERS found out. Mordecai shook his head. "It is not good to THINK of such things," he thought to himself. "Esther will be fine." Low voices awakened him from his deep thoughts, and he moved along the wall towards the gates. "Next Friday the King will be out hunting. We could kill him then," whispered a deep voice. Mordecai gasped! "No, there are too many people," said another voice. "It is best to do it while he is sleeping." Mordecai peeked around the corner and saw the men standing there. His eyes widened when he recognized Bigthan and Terish. He stood flat against the wall and continued listening. "Then when can we get rid of him? It is best to do it as soon as possible in case this gets out!" "I know. I know. But we must be careful not to get caught. Maybe it would be best to do it while he is sleeping." "Yes, maybe it would. When shall we do it?" Mordecai leaned closer to catch the other man's response. He didn't dare breathe. "Tomorrow night," the other man whispered. Mordecai closed his eyes, then quickly rushed to the gardens towards Esther's chambers. How would you feel if you had to stand before a king? Do you think you'd feel a little scared? Was Esther only beautiful on the OUTSIDE? Mordecai was at the right place at the right time. What do you think could have happened if he hadn't heard those men plotting the King's death? Do you think he kept it a secret? You are VERY special to God, just the way you are. "As the Father hath loved me, so have I loved you..."